America’s first “celebrity” general, William Tecumseh Sherman was a man of many faces. Some were exalted in the public eye, others known only to his intimates. In this bold, revisionist portrait, Robert L. O’Connell captures the man in full for the first time. From his early exploits in Florida, through his brilliant but tempestuous generalship during the Civil War, to his postwar career as a key player in the building of the transcontinental railroad, Sherman was, as O’Connell puts it, the “human embodiment of Manifest Destiny.” Here is Sherman the military strategist, a master of logistics with an uncanny grasp of terrain and brilliant sense of timing. Then there is “Uncle Billy,” Sherman’s public persona, a charismatic hero to his troops and quotable catnip to the newspaper writers of his day. Here, too, is the private Sherman, whose appetite for women, parties, and the high life of the New York theater complicated his already turbulent marriage. 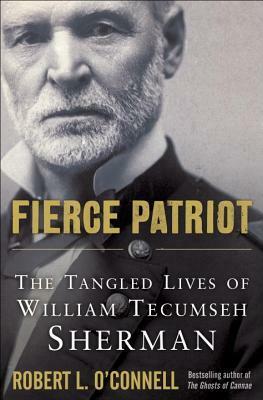 Warrior, family man, American icon, William Tecumseh Sherman has finally found a biographer worthy of his protean gifts. A masterful character study whose myriad insights are leavened with its author’s trademark wit, Fierce Patriot will stand as the essential book on Sherman for decades to come. This book about General Sherman, goes into much more detail about every part of his life than any book about him that I have read before. The author also takes you back into his father’s life before he died and how he would be placed with the family that would be forever locked with. Some of the stories from West Point I had read before in some other books, but when this author takes you through his time fighting in the Seminole War, it was an in depth look at how it was fought and how also when he was traveling in the South how he had a memory of not only facts but also terrain. This would come into play later in another war. Then you have his marriage and then leaving the service for a time to try banking, which by all accounts he was good at just got into it at the wrong time. When he was offered a job to be Louisiana, to be head of a military school he thought that to be strange and he also notice on his way there that other places men were marching and drilling. This later would all make sense. When the war started he requested to be given back his rank, and was but was in charge of a volunteer unit and the lack of marching and drilling would be one of his completes after Bull Run. People not noticing that the South had been planning for several months, and what really got him was who in most cases they were using weapons and ammo that was property of the United States, not Confederate. The battles I will skip for they are all been talked about many times. What I had not paid attention to was when he started his march to the sea he did a few things. First he had his medical staff give everyone a physical and anyone how was sick or wounded but had not told anyone was sent back to Memphis. Once this was finished the men that were left felt that they were special and they were to him. Next everyone including officers would sleep on the ground no tents, and they would only carry so much food the rest would be got off the land or farms. Everyone was given ammo and he split he Army in three fingers so the when he was being followed they did not know which one. Then he went to Jackson Mississippi, he attacked the capitol of Mississippi, and when they were done they started their march. There would be no long drawn out battle with the South as the fighting would get going he would inflict damage save his men and move on. His men began to call him Uncle Billy, for he was always looking out for them. He burned part of Atlanta, for they made weapons, ammo and other war supplies, but the first fire was started by the South not wanting them to get anything. Now when you get to South Carolina yes they burned just about every town they came upon for he felt since they started the war they should feel the full force. When they got to North Carolina, they stopped except for the capital of every state he went through they destroyed that city as well. The picks up his life after war and his fighting out west and some of his fighting in D.C. this would cause him and Grant not to speak for many years. He did say later that he felt that “the black man should be able to vote since that is what we fought for “. He felt the politicians took away their rights wars after the war. It was said that he walked out of someone speaking and was seen sitting with a black gentlemen on a park bench smoking cigars, when asked he said “the conversation was better “. That I believe. He change the way wars were fought and now his ways are still being taught and used to this day. He had a tank named after him in WWII, and most of Fort Bragg sits on ground that he did his march to the sea on. This is a through look at a great soldier’s life until his last breath, not enough words can say how much I enjoyed this book. I got this book from net galley.